"I will lead my battalion into the Argonne, but I doubt if you will see me or my men again." It is a shame there are not more movies about World War I. Stanley Kubrick's Paths of Glory (1957) was exceptional, but since then technological leaps and bounds have been made in realistically dramatizing the sheer horror of warfare. The Lost Battalion is a polarizing film that effectively displays these horrors and nobly honors the soldiers who fought for their country so long ago. It is proof that there are many interesting stories yet to be told about "The Great War", and it is the best made-for-television film I have ever seen. The story begins near the end of the war, shortly after the Americans joined the French and British forces to fight the invading German armies in the Argonne region of France. It focuses on the true story of the U.S. Army's 77th division, 308th infantry battalion, led fearlessly by Major Charles Whittlesey (Schroder). Trapped in the Argonne forest for five days without adequate ammunition, food, or supplies, these men fought off countless German assaults before finally signaling air support to their eventual rescue. I was not familiar with Major Whittlesey before I saw The Lost Battalion, though he has now become my new personal hero. Through Rick Schroder's tour-de-force performance, the film paints a portrait of a man who displayed undying loyalty for his men and his country without ever sacrificing his own self-worth. Facing insurmountable odds, he refused to surrender, even after countless pleas by his men to retreat. Like his men, he wanted nothing more than to return to his simple life as it was before the war, but also knew that his duty to his country took precedence over selfish urges. His stubbornness, bravery, and insistence to speak his mind before his superiors ultimately led to the end of the war, and appropriately earned him the Congressional Medal of Honor. The filmmakers have clearly done their homework, and portrayed the events that befell the 308th battalion with stunning realism. What astonishes me about the battles of WWI is how ruthlessly up close and personal they were. The soldiers left their trenches in a suicidal rampage, and continued their onslaught towards the opposing forces until they were eye to eye. The Lost Battalion shows this without compromise; this is certainly not a film for the squeamish. Bayonets are thrust into the necks and torsos of unfortunate victims. Handguns are discharged right up against the enemy's foreheads. In the film's finale, the German army mercilessly marches against the U.S. army with a barrage of flame-throwers. All of this carnage takes place close enough for the soldiers to whisper dying words into the ears of their assailants. Another fascinating aspect of the war was the use of carrier pigeons trained to transport written messages back to headquarters. With their lines of communication completely severed, the birds proved to be absolutely essential to the 308th Battalion. The Lost Battalion includes the story of real life carrier pigeon Cher Ami, who was shot by a German handgun while attempting to deliver a crucial message. Despite this near-fatal injury, Cher Ami successfully delivered the message to headquarters and, as a result, saved hundreds of lives. Today, he has a place of honor at the Smithsonian Institution. If somebody had told me that they were honoring a pigeon at the Smithsonian before I saw this film, I would have probably laughed myself silly. After seeing The Lost Battalion, I realize that Cher Ami's honored placement is justified and deserving. Screenwriter Jim Carabatsos wisely pays attention not only to the harrowing battles, but also to how they wither the emotions of the young soldiers. They are ordinary men placed in extraordinary situations, and the film instills this quietly without becoming overtly philosophical. The atrocity of warfare often inspires enriching dialogue between these characters, such as what it truly means to be an American. Their introspective musings are rich and insightful without ever weighting down the impact of the film. Carabatsos gets down to the heart of each character without investing too much time on any one man. When tough talking Sergeant Gaedeke was blown to bits, I found myself feeling no less sympathy than I did when meek and innocent Private Yoder was shot and killed. Director Russell Mulcahy combines all of this material into a fantastic depiction of war. It is obvious that he has scrupulously studied Steven Spielberg's masterful techniques from Saving Private Ryan, yet has also created an exemplary style of his own. Before the initial offensive on the Germans, he takes time to study every emotion on the faces of these young men. No words are spoken, but their heavy breathing and twitching eyebrows speak more sentiment than words ever could. Much like Spielberg, Mulcahy uses hand-held cameras to glide through the heart of the battles, conveying an appropriate sense of chaos. He also proves to have a few unique tricks up his sleeve; particularly noteworthy is a glimpse from a bullet's perspective, beginning with its initial discharge to the moment it makes contact with its hapless target. All of these stylistic elements are molded into a picture that is gruesomely harrowing, while still incredibly entertaining. The Lost Battalion ennobles everything a good war film should. There are unflinching moments of sickening combat, vivid character portraits, and last but certainly not least, heartfelt emotion. When Major Whittlesey surveys the surrounding bloodbath at the close of the film, a teardrop gently slides down his cheek, which left me incredibly choked up and feeling a strange urge to stand up and salute. French filmmaker Fran�ois Truffaut once said that it is impossible to successfully turn a war film into an anti-war film, since the depiction of combat always seems to inappropriately convey a grand sense of adventure. 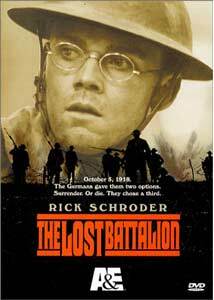 The Lost Battalion, like the best war films, proves him wrong. It fully illustrates the horrors of battle without undermining the tremendous sense of respect felt for these courageous men who valiantly fought for their country. Image Transfer Review: The 1:33.1 image transfer is a pleasant experience, yet exhibits several noticeable distractions. Shimmering and compression artifacts are over-abundant during the first 20 minutes, though they do not prove to be as bothersome for the rest of the film. The most disappointing factor is a strange digitized anomaly, which briefly occurs between cuts. It almost appears as if someone has inserted subliminal images of horizontal window blinds between frames. Otherwise, the picture quality is first-rate, boasting excellent cinematography; the intentionally muted colors and glistening beams of light always look superb. Another pleasantry is that the disc is RSDL, making full use of DVD's available bitrate. Being a made-for-television film, I was not expecting a stunning transfer, and my humble expectations were exceeded in some regards. However, the few abnormalities are disappointing for such a recent production. Audio Transfer Review: It is widely believed that to accurately depict the ravages of war, a film needs a powerful multi-channel soundtrack complete with gut-wrenchingly deep bass. Unfortunately, this is where The Lost Battalion falls short. Working with a somewhat modest television budget, the soundtrack is an intensely subdued stereo surround mix. While the lack of deep bass proves incredibly disappointing, the soundtrack does exhibit favorable overall fidelity. Stereo separation along the front soundstage is wide and stunningly realistic. Dialogue is predominately ADR-produced, though surprisingly natural. Surround use is subtly engaged when necessary, with the haunting musical score flowing nicely in and out of the surround speakers. A 5.1 track would certainly be justified for a film of this nature, though I found myself pleasantly surprised by the stereo surround mix. Extras Review: All I wanted or expected from this DVD was a good documentary on World War I, which I did not get. Instead, I was given a great documentary on World War I. Originally airing on The History Channel, Dear Home, Letters From WWI proves to be the perfect companion piece for The Lost Battalion. This telling program contains a wealth of actual footage from the era, along with narrated correspondences. Several of the actors involved sound somewhat artificial in their readings, but hearing and feeling the emotion of these true-to-life letters written during World War I is enough to suspend my criticisms. Also included are a biography and filmography for Rick Schroder, as well as DVD production credits. Many fans of the war genre probably do not know this powerful film exists. I am eagerly hoping this DVD will prevent it from remaining in relative obscurity. Do not be fooled by its made-for-television status; The Lost Battalion is as compelling, exhilarating, and sobering as the best war films ever produced. An honorable gesture towards the valiant soldiers who served in World War I, A&E has gone above and beyond the call of duty in creating a DVD that provides enriching entertainment for film buffs and historians alike.